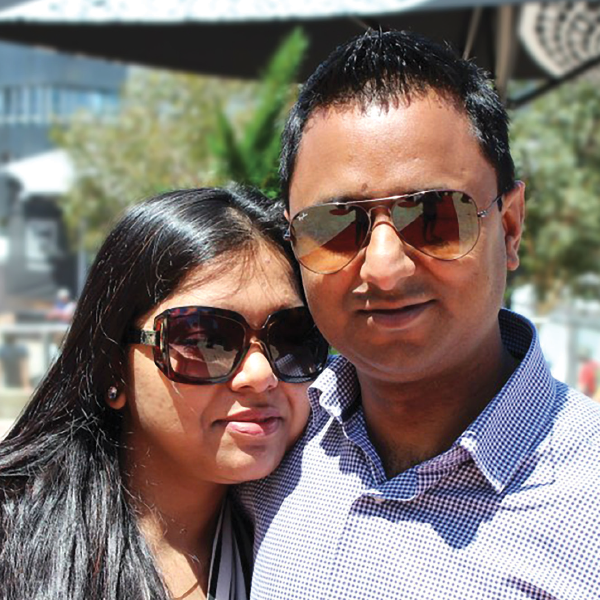 When Sanjeev and Illa’s baby girl was born, they wanted a way to escape their ‘hectic’ jobs. Initially, they started small and focused on building cashflow. Three years later, they’re just a deal or two away from replacing Sanjeev’s income, and having the family time they so desperately wanted. Despite having cash flow as their main focus, they’ve managed to increase their equity 10-fold. When Sanjeev and Illa’s baby girl was born, they wanted a way to escape their ‘hectic’ jobs. Initially, they started small and focused on building cashflow. Three years later, they’re just a deal or two away from replacing Sanjeev’s income, and having the family time they so desperately wanted. Despite having cash flow as their main focus, they’ve managed to increase their equity 10-fold. With a baby on the way, Sanjeev and Illa were desperate to find a revenue stream that could give them breathing space from their day jobs. After attending one of Dymphna Boholt’s one-day events, Sanjeev knew it was the right course for them. Starting out, they had about $80,000 worth of equity in their principal place of residence (PPR), $35,000 in a deposit for an off-the-plan apartment that had yet to settle, and $25,000 worth of credit card debt. They were cashflow negative and thought it would take a long time to get out of that hole. However, Sanjeev and Illa diligently applied everything they learnt from Dymphna and made headway at an astounding pace. This is how they did it. With just $20,000 to work with, Sanjeev and Illa had no choice but to start small. They spent their weekends scouring regional areas within a 100km radius of Sydney. They looked at more than 30 properties until they found land with sub-division potential. Following Dymphna’s advice of using a joint venture to increase their muscle, they bought the property for $85,000, spent just $2,000 on the subdivision and created two parcels of land worth $80,000 each. This first step boosted their confidence and hunger for more. With their focus on affordable regional areas, Sanjeev and Illa began looking for properties where they could execute multiple strategies at once. They found a property with potential in Bathurst for just $299,000. They spent $50,000 in renovations and added an extra toilet so they could rent the property out room by room. They earn $11,000 off the property each year and created $50,000 worth of equity. After increasing their cashflow and serviceability, Sanjeev and Illa opted to build on the land they bought in their first deal. After realising that the standard four-bedroom home would not give them the cashflow they desired, they built a house and granny flat under the same roof, creating a dual-occupancy, dual-income property. 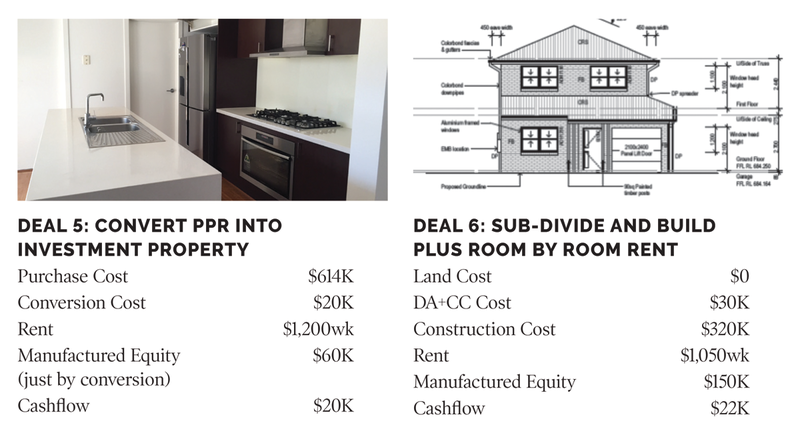 With a construction cost of $410,000, Sanjeev and Illa created $140,000 worth of equity. The main house brings in $350 per week in rental and the granny flat brings in $280 a week, which puts in another $10,000 into their pocket each year. Sanjeev and Illa’s off-the-plan unit had settled and with the rental income it was creating, it was cashflow neutral. Sanjeev and Illa used the opportunity cost framework they had learnt from Dymphna and realised they were better off selling. They sold the property a year after settlement for a profit of $116,000. After considering everything they’d learnt about property investment, Sanjeev and Illa started wondering if their PPR was pulling its weight. After exploring a couple of strategies, they decided to rent and renovate their PPR. They spent $20,000 and turned their second living area into an extra bedroom. Now, they rent the property out room by room. This pays them an extra $20,000 a year and has increased their equity by $60,000. Going back to the cheapie they bought in their second deal, Sanjeev and Illa realised they could subdivide the property and build another house which they could rent out room by room. They spent $350,000 on construction and estimate to pocket $1,050 per week in rental income. This deal has increased their equity by $150,000. In just three years, Sanjeev and Illa have increased their equity from $90,000 to just shy of $900,000 but, more importantly, they’ve have increased their cashflow to $62,000 a year. Sanjeev estimates that he is just one or two deals away from being able to quit his day job. Property investing has been incredibly gratifying for Sanjeev and Illa’s financial position and family life – they’ve even been able to put their nieces in India through university! Their story shows that with commitment and passion, any amount of money can be leveraged to create a better life.